A USB storage device should be normally connected if logging data. The CPU maintains an internal 73KB buffer for temporarily logging data while no USB storage device is present. Data in the buffer will not be retained through a power cycle. Let’s get started. From the Main Menu you can select Setup | Data Logger. The final method is also under the main menu, Tools | Data Logger. 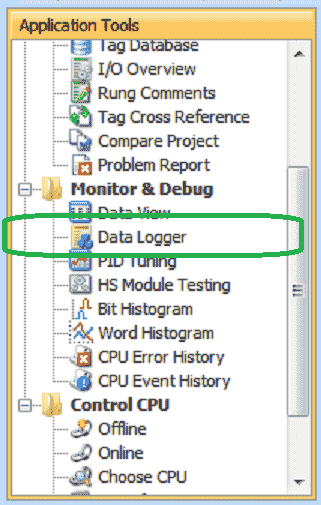 Event Data Logging – The logging will happen on the transition based on the ON status of the specific Boolean Tag (bit) specified in the Event Bit Tag Name. Every Minute: Tag Data will be logged once per minute. Every Hour: Tag Data will be logged once per hour at the designated minute (0 – 59). Once per Day: Tag Data will be logged once per day at the designated hour (0 – 23) and minute (0 – 59). Once per Month: Tag Data will be logged once per month at the designated day (1 – 31), hour (0 – 23) and minute (0 – 59). Removable Media File Name – Enter the prefix of the file name for the USB device. The name entered will always be appended by “-MMDDhhmm.csv” where the time and date are the CPU time and date of the first entry. The CPU will create a “LOGS” folder on the USB storage device and save the log file there. Every Hour: A new CSV file will be created once per hour at the designated minute (0 – 59). Once per Day: A new CSV file will be created once per day at the designated hour (0 – 23) and minute (0 – 59). 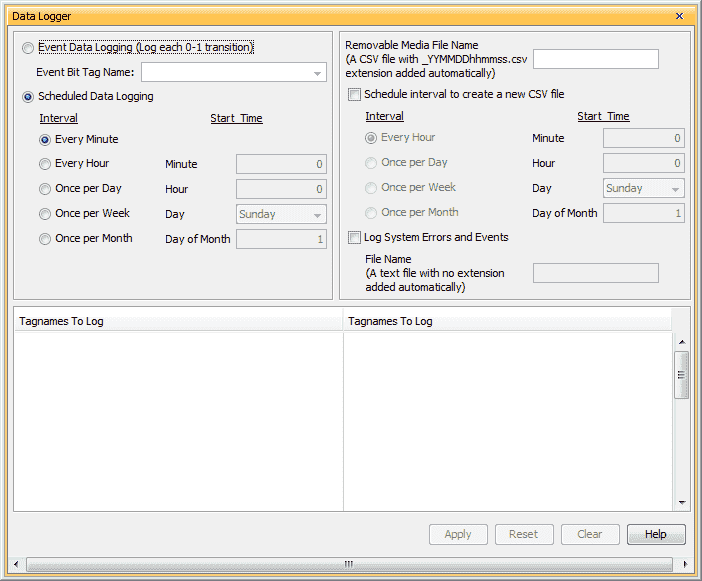 Once per Week: A new CSV file will be created once per week at the designated Day (Day of the week (Sunday … Saturday). Once per Month: A new CSV file will be created once per month at the designated day (1 – 31), hour (0 – 23) and minute (0 – 59). Log System Errors, Events & File Name – Select to log system errors, events and enter a file name for logging the systems errors and events. 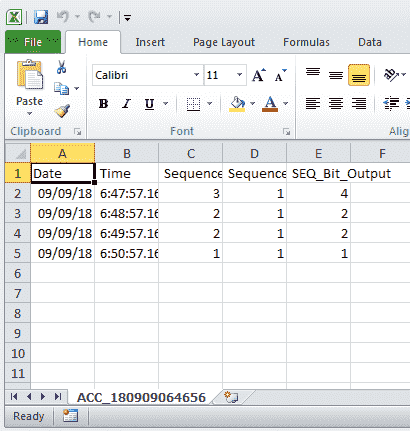 This function will create a text file containing system errors and events with the time and date the error or event occurred. Tagnames To Log – Enter up to 64 Tag Names (32 per column) to be monitored. 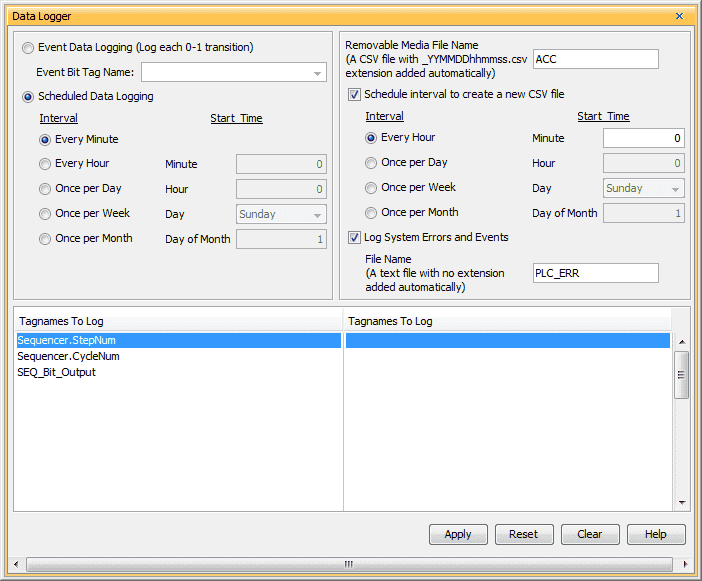 Each entry in the log file will include time and date fields. Our example will log the values every minute. (Scheduled logging) The file media name will be ACC. The _YYMMDDhhmmss.csv will be added to the file name. This represents the Year (YY), Month (MM), Day(DD), Hour (hh), Minute (mm) and Second (ss). Every hour we will start a new CSV file. 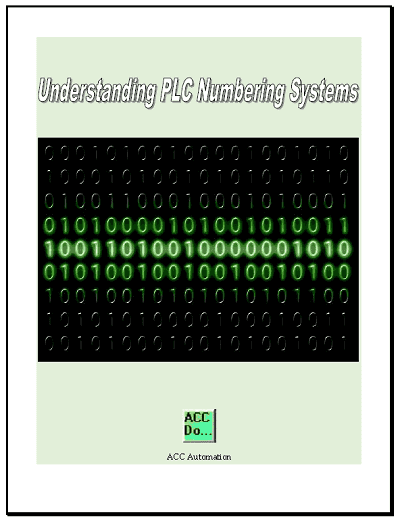 Log systems errors and events to a file called PLC_ERR. 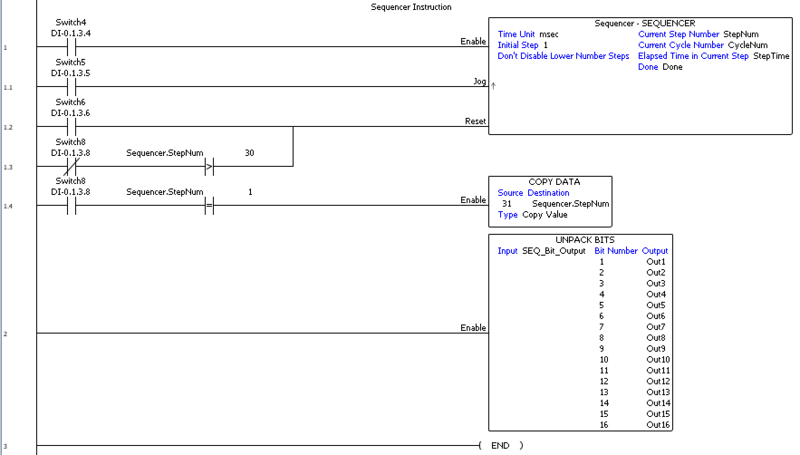 Our tag names will be from our sequencer example discussed previously. Hit Apply. We will then use the upper X in the corner to close the Data Logger window. Here is the program that we created for the sequencer. Note: All of the logging is done without a lot of programming. After running the program, we can then turn the PLC to stop mode and remove the micro SD card from the CPU unit. Looking at the files on the card we will see the LOGS folder. Inside the LOGS folder we will see the logged information and error and event file. Opening the log file in excel we can see the three individual tags with the date and time stamp. Each of the records are separated by one minute as we specified earlier. 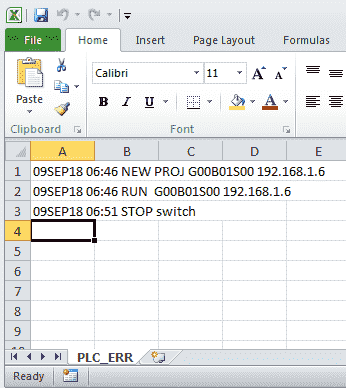 The error and event file will show when the new program was put into the PLC, the RUN and STOP events. There are two system bits for the portable memory device (PMD). The portable memory device ready is used to determine the status of the memory device. The portable memory device eject is used to reject the memory device from the PLC without causing errors on the device. 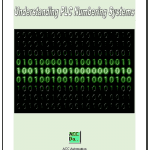 Data Logging on the Productivity Series PLCs is very easily accomplished with this built in feature. Watch the video below to see the data logger that we created in action running on our Productivity 1000 Series PLC. Next time we will look at the Web Server in the Productivity 1000 Series PLC.